Active Timer is an awesome, resource friendly and super simple to use time tracking application; it isn't like other applications. It is the ultimate time tracker for those that multitask or anyone that bills by the hour. This is truly a time tracker you launch and forget. The truth is that most time tracking applications requires both some time and your attention. In most cases you even need to spend time to set things up before you can start tracking the time. And if you go idle, some handle it - but none all that well. Like most serious time trackers, Active Timer will detect when you are idle. How you later deal with that time spent away from the screen is another story. Active Timer will let you label and save your idle time, so you can add it to a timer set or later to your billable hours. This way every phone call or meeting can become part of the log maintined by Active Timer, no need to keep a separate spreadsheet or additional notes. Everything is neatly stored in one place. Active Timer tracks everything you do on the computer and even helps you deal with time spent away from the screen, it leaves your working efficiently with the tasks at hand - even if you multitask. And that's the beauty of Active Timer. Unlike other applications, Active Timer truly tracks everything; each document, every window - everything you do, and it shows it all in a beautiful, easy to read list of applications and their respective documents/windows. - Fully reliable time tracking; unlike other time tracking software, Active Timer correctly tracks documents even if you rename or somehow change them. 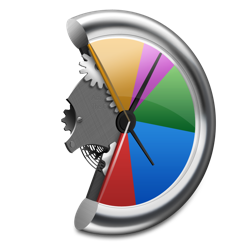 - You can create sets of timers by simply selecting the applications and/or documents you want to track, and dragging them to the sidebar. And you don't have to do any of this before the work is actually completed. 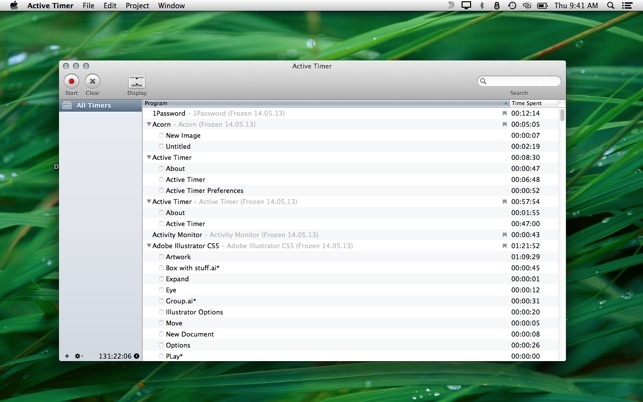 - When you've been away from your Mac, Active Timer will let you choose how to handle this idle time when you return. You can choose to label it and add it to a project, delete it or simply add the time to the global idle timer. - Active Timer can live in the Menu Bar, in your Dock or both; you choice. - Export timers in either CVS or Active Timer format, so you can easily import the tracked time into any spreadsheet or word processor. The export process can even be automated, to run in the background at certain time and days each week.